More than seven in 10 Americans think Sarah Palin is not qualified to be president, according to a new national poll. WASHINGTON (CNN) - More than seven in 10 Americans think Sarah Palin is not qualified to be president, according to a new national poll. Seventy-one percent of those questioned in a CNN/Opinion Research Corporation survey released Wednesday morning believe the former Alaska governor and 2008 GOP vice presidential nominee is not qualified to be president, with 29 percent saying she does have the credentials to serve in the White House. Republicans appear split, with 52 percent saying she's qualified and 47 percent disagreeing with that view. The poll indicates that about half of the country, 51 percent, has an unfavorable view of Palin, with 42 percent seeing her in a positive light. Nearly two-thirds of those questioned say Palin's not a typical politician, and feel she's a good role model for women. Fifty-six percent add that Palin cares about people, and a similar amount think she's honest and trustworthy. But the survey indicates Americans are split over whether Palin shares their values, agrees with them on the issues, or if she's a strong leader. "Sarah Palin has one advantage that many past Republican candidates have not shared - Americans think she cares about people like them," says CNN Polling Director Keating Holland. "But her biggest Achilles heel is the number who think she is not qualified to be President. Those numbers are similar to what Dan Quayle got in 1993, when only 23 percent thought he was ready for the White House." In a very early look at the next race for the White House, the survey indicates that nearly one in three Republican voters, 32 percent, say they would be most likely to support former Arkansas Gov. Mike Huckabee in a hypothetical battle for the 2012 GOP presidential nomination, with Palin seven points back at 25 percent, and former Massachusetts Gov. Mitt Romney at 21 percent. Five percent said they would back Minnesota Governor Tim Pawlenty, with one in ten suggesting they would support some one else. "Huckabee appears to have more support among Republicans than Palin and her unfavorable rating among all Americans is twice as high as Huckabee's," Holland says. 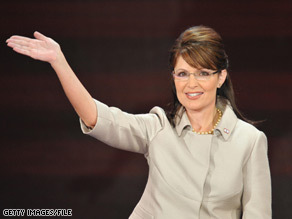 "Palin may attract a lot of attention but the GOP may be looking elsewhere for their frontrunner." It's the pre-season for the next White House contest, as possible GOP contenders form political action committees, campaign for fellow Republicans, write books and address conservative conferences and party dinners. The poll's release comes the same day that Romney, a 2008 Republican presidential candidate, campaigns in Virginia with Republican gubernatorial candidate Bob McDonnell, and less than three weeks before the release of Palin's book, "Going Rogue, an American Life." The CNN/Opinion Research Corporation poll was conducted October 16-18, with 1,038 adult Americans questioned by telephone. The survey's sampling error is plus or minus 3 percentage points for all respondents and plus or minus 4.5 percentage points for questions asked only of Republicans. I would never vote for Sarah Palin for anything. She is way too right-wing extremist in domestic and foreign policy, as well as regards religious views. CNN...there is nothing wrong with hoping she will go away. But she wont. She will continue to be viewed as the exact opposite of the Obama administration, which will endear her greatly over the next few years, at least. Let's put this in proper perspective. Bad news for CNN: They poll last in cable news. Badder news for major newspapers (except WSJ): All are plummeting in popularity. I am not a fan of Sara Palin, I did not vote for John McCain, but the lack of qualifications for the office of the president applies to Obama. He is naive, lacks military or international experience, and fancies himself some sort of savior. Talk about qualifications. He is a community organizer (whatever that is) and barely served in the Senate. I did not vote for Obama either. Enough turkeys exist in elected office in DC. Who are the 3 in 10 who think she IS? Those are the dangerous ones. This article is hilarious saying Gov. Palin is inexperienced!! It's funny though how a "Freshman Senator" somehow is qualified to be President!! He should be in a office in the basement right now learning skills to become a good Senator!! As CNN and everyone said during the campaign " it's not time for on the job training" well everyone was right, so I say who cares if Pailn has the experience or not the road has already been paved for her. Did anyone else cry when they read this article? How dumb is America? I can't believe that 29% of our population thinks Sarah Palin is qualified to be President. Wow. Palin obviously isn't a "typical politician". In fact, she's not a politician at all. She's a former sportscaster for a local TV station who parlayed her looks and charm into a mayoral election, and then stepped into a state-wide election where the other candidates were very unpopular. This is a person whose personal ambition far exceeds her intellectual capacity, no to mention her grim academic credentials. She was stupid during the campaign that she referred to herself as the first female candidate for Vice President, erasing Geraldine Ferraro from the history books, which she had obviously never opened. The people who "like" Palin reflect their own limited understanding of the complexities of government on a national level and, as with George W. Bush's supporters, are more interested in a leader who they'd like to go huntin' with than one who has the ability to understand complicated policy issues and the articulateness to express them in a coherent way to the public. Palin represents an outrageous low point in the thinking (or non-thinking) of many voters. Finally, she doesn't warrant any of this ink, including my own. How many times do you have to run a poll with essentailly the same results. S/P makes a great cheerleader but a lousy high school class president..
if this woman is qualified to be president then Joe the Plumber is fit to be Secretary of State. Republicans are scrapping the bottom of the barrel for 2012 hopefuls. I say "Go for it, girl!" By 2012, the country will be in a great shape again. We will have fixed most of the stuff the Bush admin had botched and if we can get a quitter, blunderer, like Sarah up there to run against, so much the better. I hope she runs and gets chosen as the nominee. That means Obama and Democrats in power until at least 2016! Too cool. When John McCain shows her as his running mate he gave Democrats a gift that keeps on giving. Every time she says something stupid she makes all the Republicans that support her look stupid. Palin is less qualified than the other GOP contenders who do not necessarily inspire confidence in the electorate. At least we know who will buy her book, the gullible 29 percent. Was it really necessary to do a poll for this? I mean really, the moment she opened her mouth the world knew she was not qualified for anything. that means that about 29% of americans are completely brainless!!!!!!! which is not good news. Almost 3 in 10 think she IS QUALIFIED to be President?!?!?!??! I think THAT is the interesting statistic – Wonder what they think qualifies her... Grasp of the issues? Stick toitiveness? Ability to work with others? ANYTHING? Sarah Palin is preparing herself to quit the GOP for the conversative group. This is not news – everyone but silly Sarah knows she shouldn't be no where near politiics... Truly a pagent is her niche! Also decide by same poll: water is wet, ice is cold, sugar is sweet, etc. To paraphrase an old headline, "How Can 52% of Republicans Be So Stupid?". So Palin is qualified to be President?!? Last I heard, she abandoned her post as Governor so she could further her career, as opposed to staying put in order to further the interests of Alaskans! And if people will remember, in delivering her "Adios" speech, she looked and sounded like she was barely holding it together. The GOP and it's army of fear-mongerers and liars and propagandists have driven rank-and-file Republicans mad! I can't believe anyone would consider her not qualified and yet voted for Obama. She at least was a governer as opposed to a community organizer. It really doesn't matter, it's going to Bush's fault for the next 3 years until Obama is voted out of office. The only hope we have is that the Demo's can't get anything done even though they control all branches of government. I would rather have a squirrel from my yard, sitting in the Oval Office, than the 'amazingly unqualified' snob who is sitting in the chief's chair. This man is the Commander in Chief of the greatest army in the world? Now he has the genius idea of paying the Taliban to give up their beliefs? There will never be a more irresponsible President than your President. I had to concede that he is not my President anymore. Paying the Taliban with my tax dollars, that is the last straw with me. and he is going... going... going.. and still speaking, what a fella. Palin is a breath of fresh air. Read this board and see all the hatred for her for the left wing media "jokes" about her. It's about being jelous of a very attractive and intelligen woman who is successful and NOT A LEFT WING DEM. You brainwashed attack dogs are embarassing.